Sounds like you are enjoying your Cuttlebug!!! Whoohoo for you! Too cute! They are adorable! Lucky you getting your birthday present so early! These are so cute Kendra. I've never seen these before. You did a great job. Hope you are enjoying your new CuttleBug and having a great weekend. 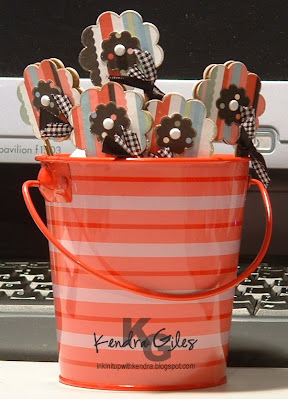 What an adorable bucket to display your super cute clips! I love your blog and your projects! !